The boxed release of the game will have a code inside, rather than a disc. Direct your attention to Amazon and you will notice that the PC version of Battlefield 1 is tagged with the notation “No Disc.” Go to GameStop and you'll see the same thing: The only purchase option available to PC owners is a download. That's because, as EA confirmed today, the PC release in North America will only be available digitally. That applies to the standard edition of the game; the “Early Enlister” Deluxe Edition will be exclusively online. And if you had hopes of throwing money (a lot of money) at the “Exclusive Collector's Edition,” which comes with a 14-inch statue, a deck of cards, a cloth poster, a patch, and a messenger pigeon tube with DLC crammed inside, you're out of luck too: It's only being released for consoles. It's obviously not great for people with slow connections and/or tight data caps, but the reality is that digital exclusivity is only a small step removed from what's already the norm for major releases: Get the disc, pop it in, and then download most of the game from Steam anyway. Pity about the Collector's Edition, though. I bet that pigeon tube is going to be seriously swanky. 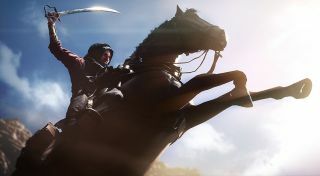 Battlefield 1 is set to come out on October 21.